Gene Norris, CG, the genealogist for the Cherokee National Historical Society, Inc. in Park Hill, Oklahoma, has organized a two-day seminar with seven interesting lecture topics – four on Friday, June 10 and three on Saturday, June 11. The location for this 10th Annual Conference will be the Osiyo Training Room, located eight miles south of downtown Tahlequah at the Restaurant of the Cherokee and Cherokee Nation Gift Shop. 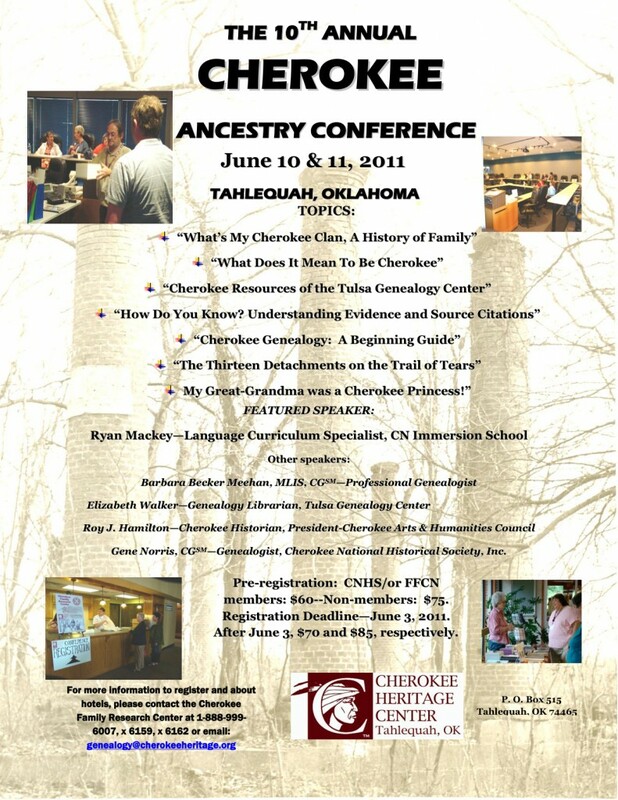 Download the 2011 June Genealogy Conference brochure pictured above (requires Adobe Reader or Preview to view). Download the Cherokee Ancestry Conference Map (requires Adobe Reader or Preview to view). Speakers will include Roy Hamilton (Cherokee Historian and President of the Cherokee Arts & Humanities Council), Featured Speaker Ryan Mackey (Language Curriculum Specialist, CN Immersion School), Elizabeth Walker (Genealogy Library Associate from the Tulsa City County Library’s Genealogy Center) and Gene Norris on Friday; and Gene Norris and myself on Saturday. For specific lecture titles and times, download the 10TH Annual Cherokee Ancestry Conference itinerary (in Microsoft Word format). You can see from the photos of the Osiyo Meeting Room on the conference brochure that it is a state-of-the-art facility. The speakers (and I have heard all except Ryan Mackey) are engaging and well informed. I recommend that you take this opportunity to learn about Cherokee ancestry research. I hope you can arrange to attend.